Shailaja Tuppad’s career journey took her from software development in India to graduate studies in Durham, North Carolina, to a career break in California. After being out of the workforce for two years, she found it difficult to break back into her previous field. 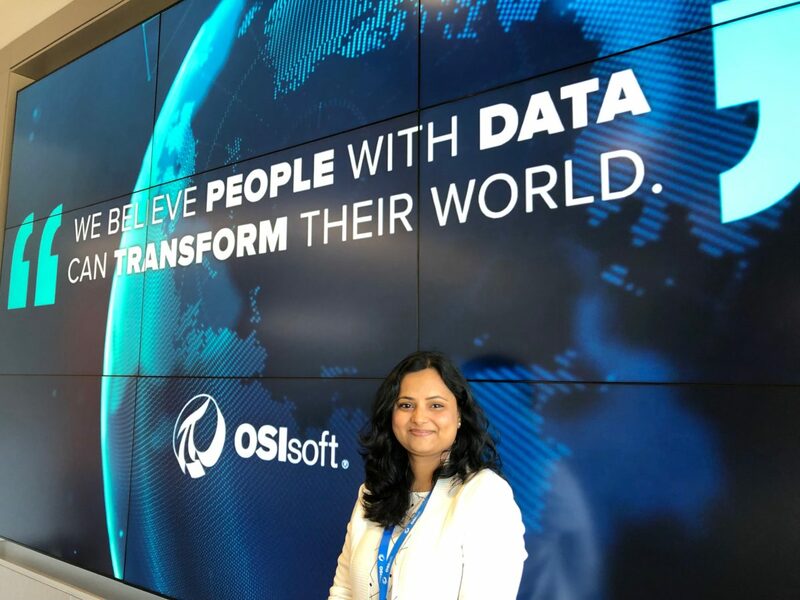 After finding out about Path Forward, she applied for and received a returnship at OSIsoft, where she was then hired full-time as a Software Developer. How many years of experience did you have before you took a break? I had four years of experience with software development in India. I then came to America and completed my Master’s in Computer Science at the University of North Carolina, and worked in the state for a year and a half. My husband then had to move to California for his job, and I followed him. I could have stayed in North Carolina until I found work in California, but I was pregnant at the time, so I decided to take a break. What type of work are you doing now? Are there any skills from your previous experience that you use in your new position? I’m now a Software Developer, and am using most of the experience and knowledge I gained at my previous jobs. This was the field I wanted to continue in after my career break, but found very difficult to get back into. After completing my returnship in Software Development, I was hired full-time and given a promotion to the next rung on the ladder. I’m very happy that my managers have trusted me enough to give me more responsibilities. How long were you out of the workforce? I was out for exactly two years. How long were you actively looking for work prior to applying for a Path Forward returnship? What was that experience like? One year into my career break, I started looking for jobs, but I struggled to even get an interview. I must have applied to anywhere from 100 to 150 jobs, but only heard back from around 10, most of which were for contract positions. It was very hard for me to break through that first layer of screening because I had taken time off. I searched for a year, then I decided to take a contract position at Apple in Development Operations. While working there, I had stopped looking, and found out about Path Forward completely by accident. It’s like they say – life-changing opportunities happen to you when you least expect them! How did you find out about Path Forward? My friend’s husband works for PayPal which has its own returnship program with Path Forward. She was telling me about what she learned of return to work programs from her husband, but didn’t directly mention Path Forward. I was so interested in the idea that I went home and started doing internet research on these programs. Path Forward was the first result that came up when I searched “back to work programs,” and luckily, the application window for the next program was still open. What is the most challenging part of returning to work? It would have to be leaving my small baby every day. He falls sick now and then from exposure to other kids at daycare, and I sometimes have to take time off work to care for him. This was especially challenging when I was starting my returnship and wanted to prove myself. Thankfully, with my husband’s help, I’ve been able to manage. What has been the most exciting or gratifying part of returning to work? Every day, I get to work on and contribute to something that I’m passionate about. There’s a certain satisfaction to contributing to the industry again. I’m able to prove myself – to myself, to my family, and to everyone around me, and it gives me a sense of satisfaction, contentment and happiness. It makes me feel very independent, which I think is very important for a woman to feel. What surprised you the most about returning to work? I actually faced more surprises as a contract employee at Apple than I did at OSIsoft. People here have been so friendly and supportive, and have been very accepting and welcoming. I think my easier transition was due in part to the great company culture, and in part to the training that Path Forward did with the hiring managers. My supervisor was very understanding of any times I had to rush home to take care of my son, or if I ever had to work from home. He really encouraged me to help him to help me. What are you most proud of accomplishing during your return to work experience? My proudest achievement is taking up the most complicated project in my department and successfully completing it. I work on connectors – Collecting data from different data sources(sensors). The employee who was working on a very complex connector left the company, and I had to take over and finish the work in a very short time-frame. I was able to finish the project quickly and effectively, which I think contributed the most to my being promoted when I was hired full-time after my returnship. What did you find most helpful about being part of a Path Forward program at your company? The workshops for participants were extremely useful, and gave me great advice to apply during my returnship. For instance, the first workshop discussed how to best ask for feedback from your supervisors. I took this advice and regularly requested feedback from my manager throughout my returnship. It helped me improve, track my own progress, and make sure I was doing what I needed to be doing. It also helped my manager evaluate my performance over time. I also felt supported by my fellow Path Forward returnees. It gives you a feeling of comfort to be in a room full of people in your exact situation – you look around and think, if they can do it, so can I! Throughout the program, we had many opportunities to help each other, and to analyze and offer support for each person’s situation. We would also ask Tami’s advice on issues we were having, which was always amazing and – at least for me – worked like magic. Do you still keep in touch with some of your fellow returnees? Yes! My fellow OSIsoft returnees and I make sure we meet at least once a month to talk to each other, exchange thoughts and experiences, or to just eat lunch together. Path Forward has given us a community where we can relate to each other and help one another. We’ve noticed that you donated to Path Forward, and just want to thank you for your support. As an alumna of Path Forward, what inspired you to give back? I am indebted to Path Forward. I have gone through such a great struggle to get back to work. Despite me having all the education, experience, capabilities to work, I was not even given a chance. Path Forward helped me break through that barrier and get into a workplace that gave me a chance to prove myself. And Path Forward has been helping us throughout the journey of our returnships – which is amazing. They don’t just get you a returnship and leave you to go through it alone. They take the time to be there to help you succeed in it.